OEM Manufacturer of a wide range of products which include Black bruted Diamond, Natural Brown Crystal Diamond, Industrial Diamonds, Industrial Diamond, Rough Diamonds and Natural Dark Brown Raw Diamonds. This diamond is very hard bruted diamonds use for industrial single points diamond dressings tools. Diamonds size 0.25 ct.to 3.00 carat available. Its diamond points verry hard. 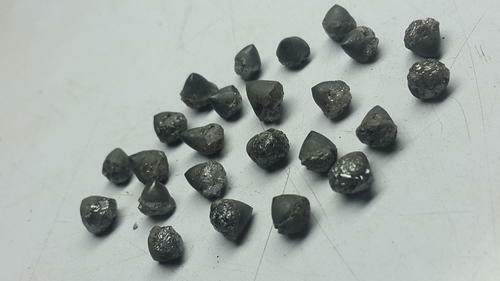 This raw rough diamond is very hard diamond s of congo .. His cutting is very fine central point bruted diamonds... This diamond useli life very long & successfull..
this diamond is very sparkling & sad brawon .its naturally uncut raw diamond . This diamond is very natural raw white diamonds .its very sparkling diamonds this diamond is available to size 0.25 sents to 2.00 carats ..
supply ability; 5000 carats per month. This rough is also available in natural point& natural.